In previous blog posts, we presented areas of strategic priority outlined in FOW’s Strategic Blueprint 2018-2020. Here we explore another priority area, which focuses on fostering an ecologically diverse and functional habitat in Wissahickon Valley Park. 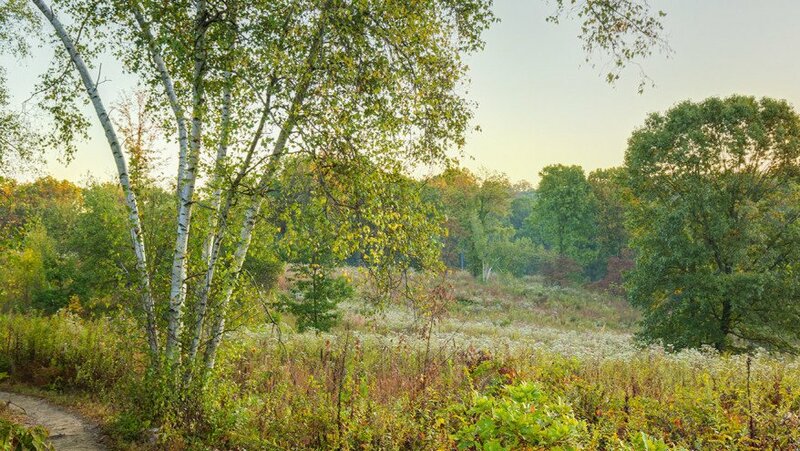 FOW’s Ecological Land Management (ELM) Plan incorporates scientific management principles that respect native flora and fauna, while promoting stewardship that engages park users in three connected programmatic areas: land management, wildlife, and watershed stewardship. In its final format, the ELM Plan will also provide preferred land management techniques for current and future use in the Wissahickon, outline what data collection is needed to monitor program success, and suggest how to integrate this data with program and project development into the future. This new plan is a much-needed update to the National Lands Restoration and Environmental Education Program (NLREEP), which was developed by Philadelphia Parks & Recreation (PPR) and the Academy of Natural Sciences 20 years ago. The NLREEP plan outlined a decade’s worth of efforts to restore portions of the natural landscape throughout Philadelphia’s parkland, including Wissahickon Valley Park. Clearly a lot has changed in theWissahickon since the turn of the century. Park use has greatly increased–more than 1.2 million visitors were counted annually in 2011/2012, and recent anecdotal counts suggest this number may have increased in the intervening years by as much as 15-25 percent. There are new invasive pests to contend with (like the spotted lanternfly and emerald ash borer), an increasingly fragile tree canopy, pervasive stormwater impacts, and new challenges from climate change stressors. Building on NLREEP, the ELM Plan will look at the entire Wissahickon, not just the natural areas, but also the built environment that encompasses and impacts it. One of the elements FOW wants to incorporate into current land management techniques is some intentionality around what we, as a community, stand for and what we want to preserve. That’s why the Academy team is asking targeted questions: What are the existing set of conditions in the park? How do they relate to conditions outside the park? What data do we have, what data do we need, and how do we use it to shift and guide our thinking, methodologies, and strategies moving forward? The ELM Plan will use the data collected by the Academy to provide outlines and guiding principles for our future work. And, as always, FOW will look to PPR for the guidance and oversight needed to articulate and achieve our shared goals, and to the community of park users for the feedback, resources, and volunteer manpower needed to implement our land management programming. FOW management zones overlaid with subwatersheds that feed into the Wissahickon will help pinpoint areas of ecological restoration both inside and outside the park boundaries. Assembling the data that already exists about this much-studied park and waterway was the first step in the Academy team’s process. They have identified data sources from more than 30 different entities spanning a half century. The team also identified data gaps that need to be filled with future monitoring and programming, and did targeted field research in the Wissahickon to supplement existing data. There are a lot of factors outside the park boundary that impact the forest and tributaries of the Wissahickon. 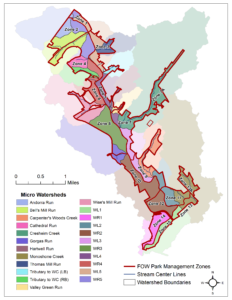 The Academy’s approach to creating land management units divides the park into hydrological catchments–geographic areas based on the major tributaries feeding into the Wissahickon. This allows us to evaluate which adjacent lands have the highest impacts on Wissahickon Valley Park, and target partnership activities and messaging with landowners that have the greatest impact on the park habitat. • Habitat management objectives and strategies specific to areas adjacent to entrances, trails, access roads, and other “high traffic” locations. In his address to the FOW membership about the ELM Plan at our Annual Members Meeting this June, Dr. Horwitz noted that one of the great things about Wissahickon Valley Park is the many ways you can access it, and that the ELM Plan will help to mitigate the impacts of porous public access on a fragile habitat. “We hope to prescribe areas of future data collection and, with increased interest from volunteers and park visitors, there is a real opportunity to utilize more citizen scientists who are currently using the park to collect data and look at changes year to year,” said Dr. Ryan. That process began at the Annual Meeting, at which the Data Scientist Mike Campagna began collecting observations and suggestions from participants. Friends of the Wissahickon’s $45,000 ELM Plan, funded by a grant from the William Penn Foundation, is expected to be complete by the end of the year or early 2019. This report will inform our future stewardship priorities, highlight FOW’s rising key partnerships, and provide a guideline for FOW’s future volunteer engagement programming. Just as the Wissahickon Valley is constantly changing, so will new challenges continue to emerge. But with a solid ELM Plan, we will be ready.